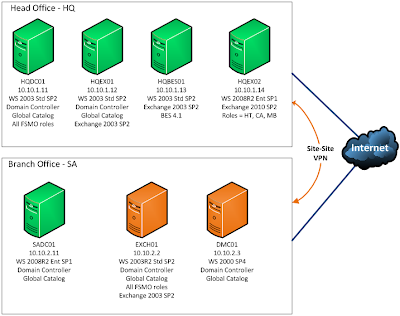 Cosonok's IT Blog: Project: Exchange 2003 to 2010 Upgrade, Coexistence, and More! Project: Exchange 2003 to 2010 Upgrade, Coexistence, and More! The following are a few notes and links that I found useful when performing an Exchange 2010 upgrade for a customer. This is for Phase 1 coexistence of Exchange 2010 with 2003. Phase 2 for decommissioning Exchange 2003 can be found here. The project also included the introduction of a 2008R2 Domain Controller in a Branch Office alongside their existing 2003 Domain Controllers, and the establishment of a Domain Trust to allow a recently acquired company existing in a different Active Directory forest, to use the new Exchange 2010 server via Linked Mailboxes. Note 1: Exchange 2010 does not support BES 4.1! In the deployment here, Blackberry was being decommissioned, so there was no need to worry about maintaining the Blackberry service by migrating BES to version 5 or above. Apologies for plugging my own blog with the first three! 4. Windows Server 2008 R2 Upgrade Paths – Windows Server 2003 SP2 ,R2 upgrade to Windows Server 2008R2 is supported, but cross-architecture in-place upgrades (for example, x86 to x64) are not supported.